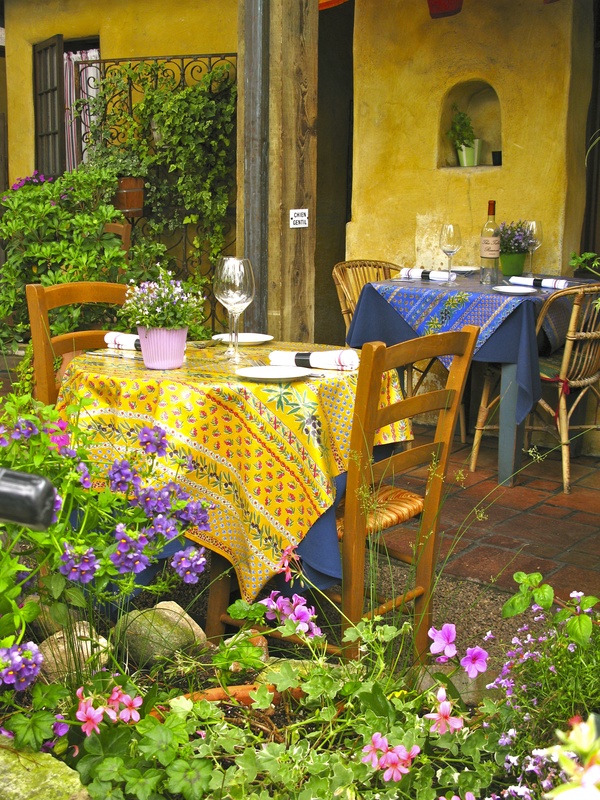 Dining al fresco in Carmel has its own particular charm. 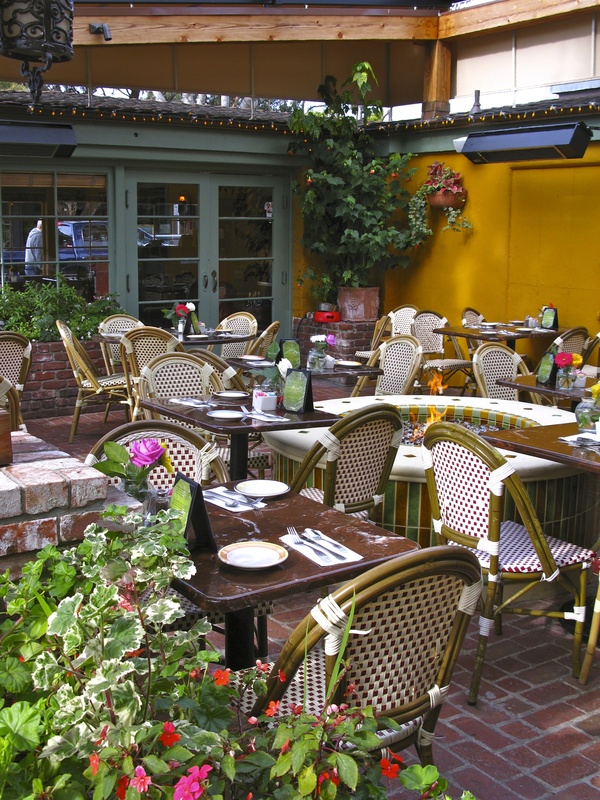 The temperate climate and Carmel’s one-of-a-kind mix of architecture make for an abundance of picturesque courtyards and hidden nooks where restaurants enchant diners. This is a special treat for Bill and I, since there are at most 15 days a year that we are comfortable eating outside in Kansas City. Admittedly, we are picky about the temperature. But our hot, humid summers send us scurrying to air conditioning. In our cold winters we beg, “please seat us in a warm spot”. I probably do not mention enough what a large part the climate plays when we decide to buy a second home here. 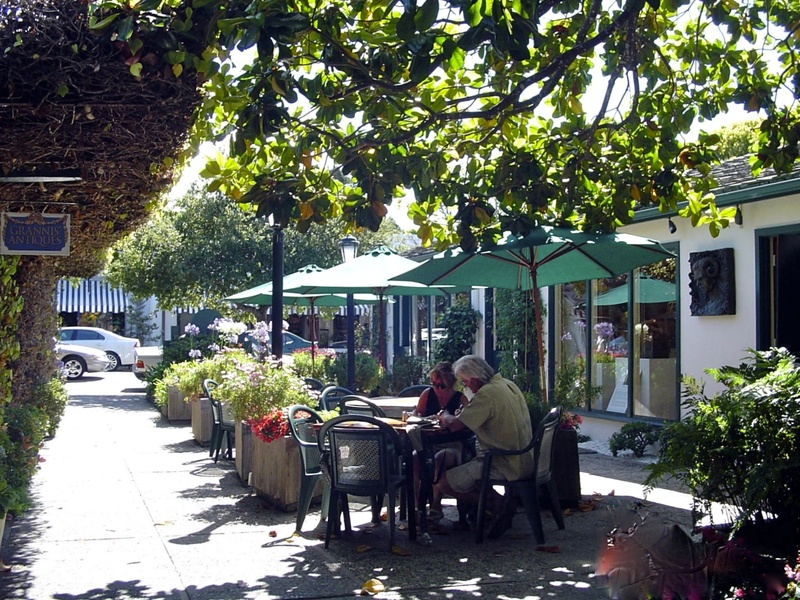 Carmel is blessed with 269 sunny days a year on average with highs between 58-70 and lows between 44 and 53 degrees. My personal favorite temperatures. 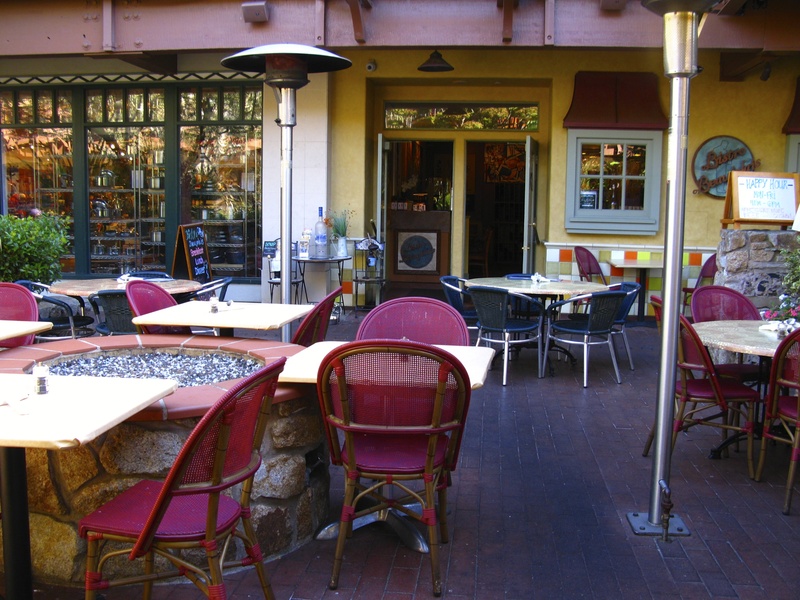 A sweater, outdoor heat lamp or shady umbrella make al fresco dining a pleasure most of the year. 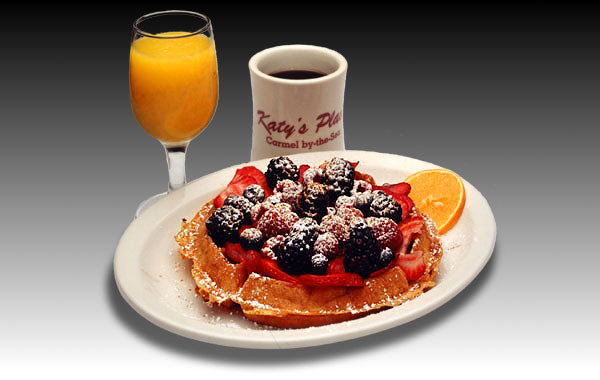 If sipping your morning coffee outside sounds good to you, try Katy’s Place for breakfast. 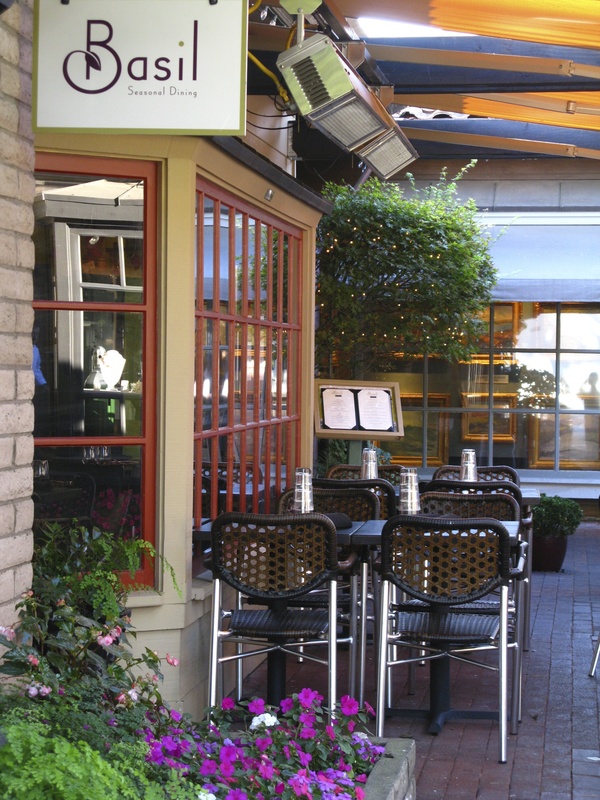 Carmel by the Sea, CA, Katy’s Place Carmel. They open at 7AM everyday. or omelets. Bill likes the Corned Beef Hash ‘n Eggs. Sit outside on the deck or inside. 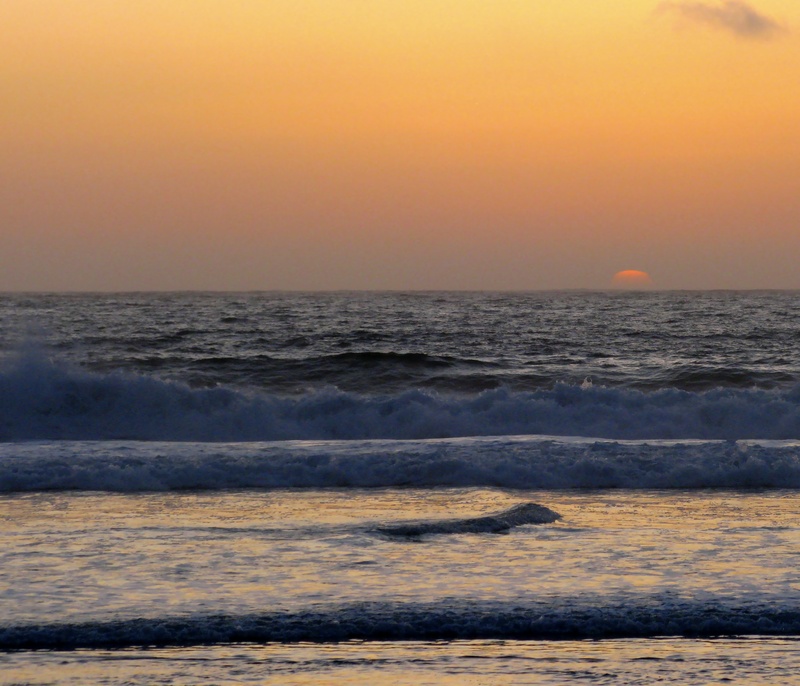 a glimpse of the ocean and the music of the nearby surf is unbeatable. 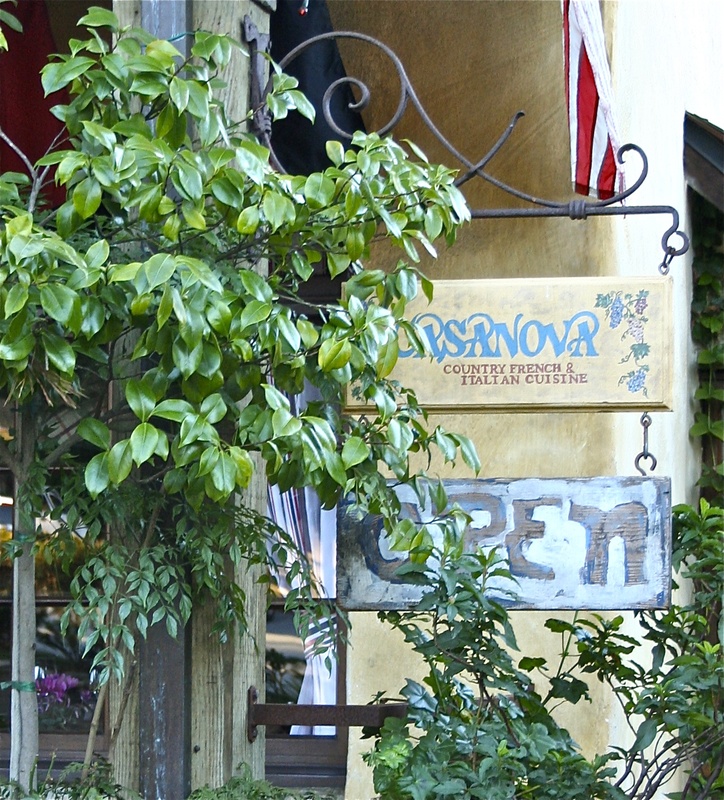 They offer a buffet or made-to order specialties. They also serve a delicious, well priced “early bird” dinner. 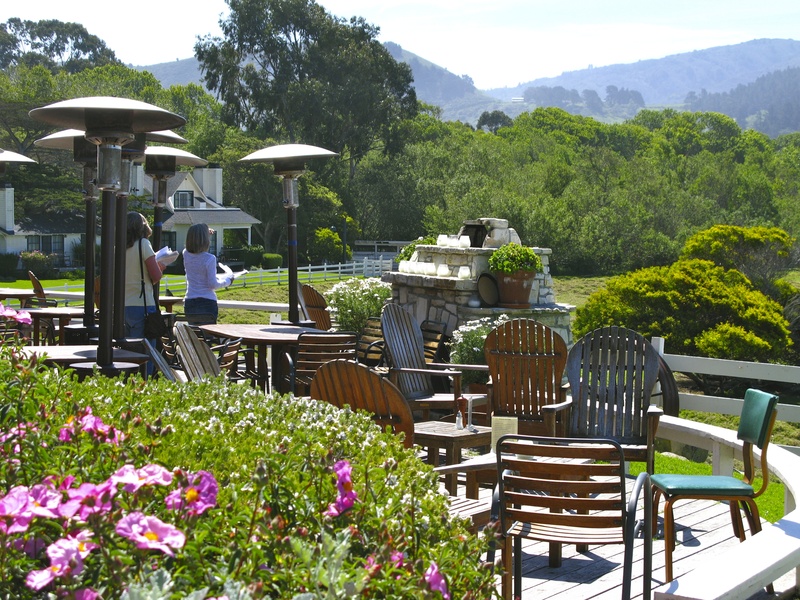 And of course, there is the Jazz Brunch at the Mission Ranch Mission Ranch in Carmel California. We save this for special occasions because it is pricey, but worth it. 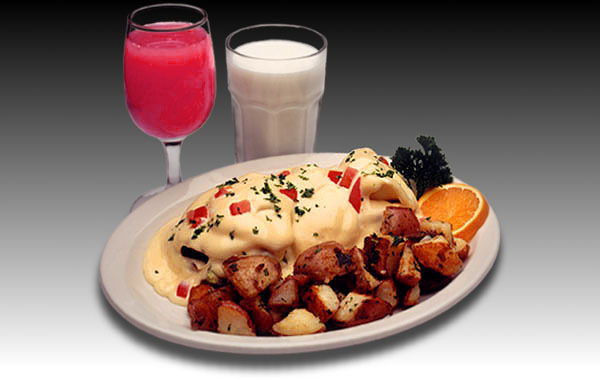 The brunch is from 10AM- 1:30PM Sundays only. 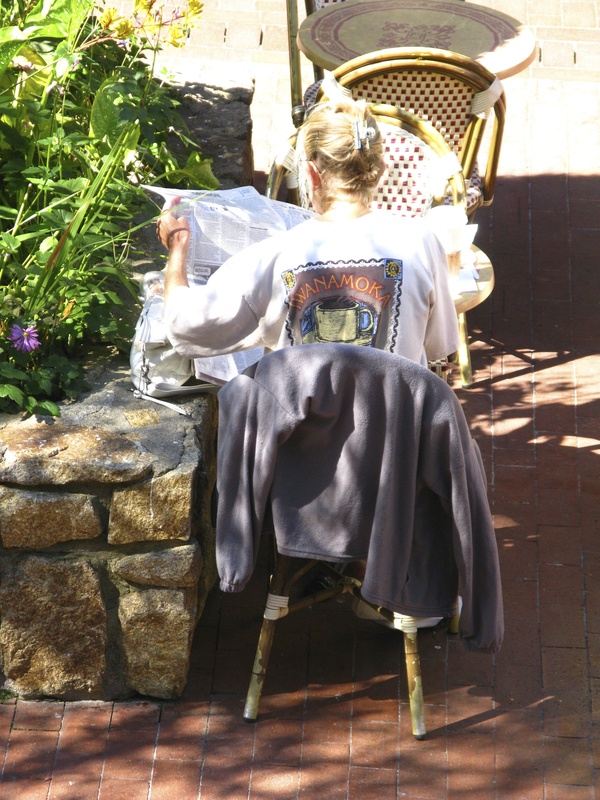 We sit on the patio overlooking the meadow and Carmel Bay. We watch grazing sheep and beautiful people ,listen to the sound of jazz drifting out the door and sip Champagne and coffee before going inside to tour the hot station, cold station, carving station AND the dessert table. The food is beautifully presented as well as delicious. 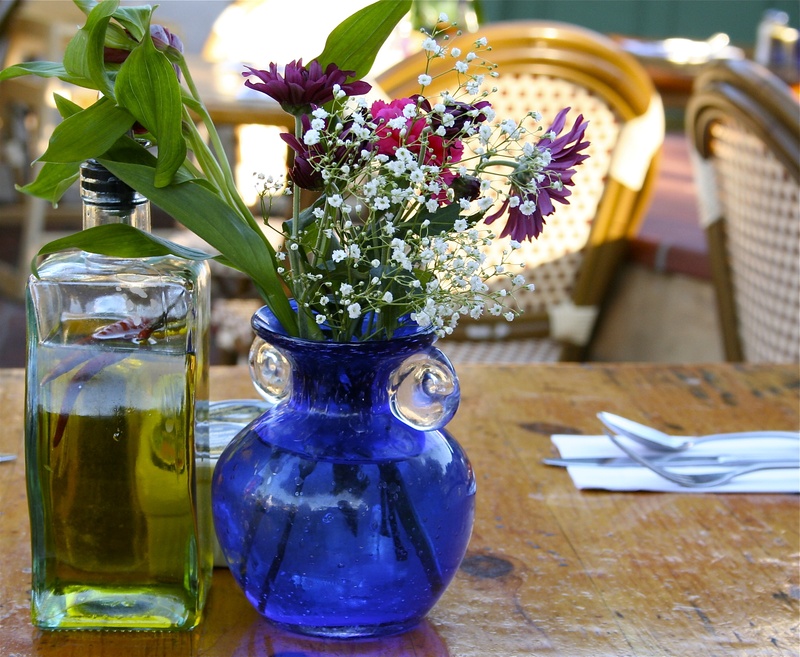 The Ranch also serves a great dinner – make reservations. 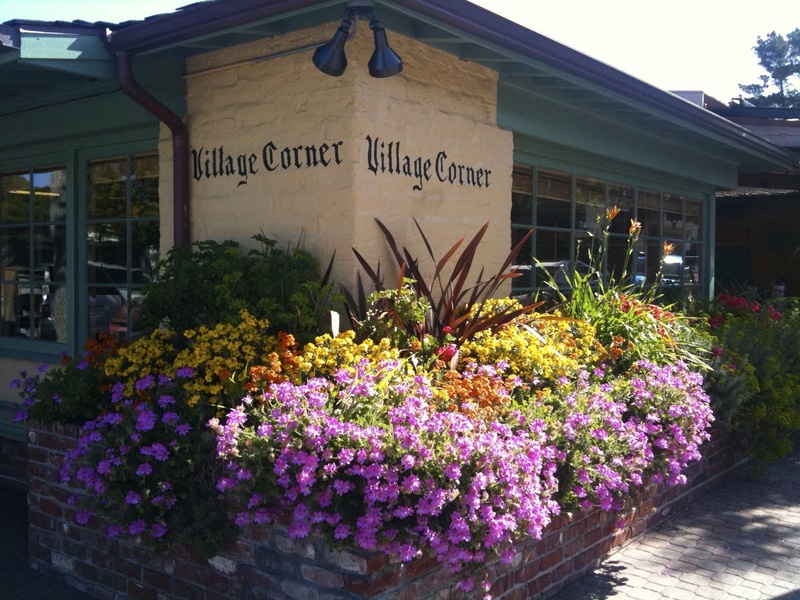 Another very popular spot in Carmel is the Village Corner Village Corner Mediterranean Bistro, Carmel-by-the-Sea with its central location at Dolores and Sixth. I find we see more locals here. One corner is “reserved” for a group of guys who daily attempt to solve the world’s problems over breakfast and newspapers. and there is open fire pit in the center. They also serve a great lunch. 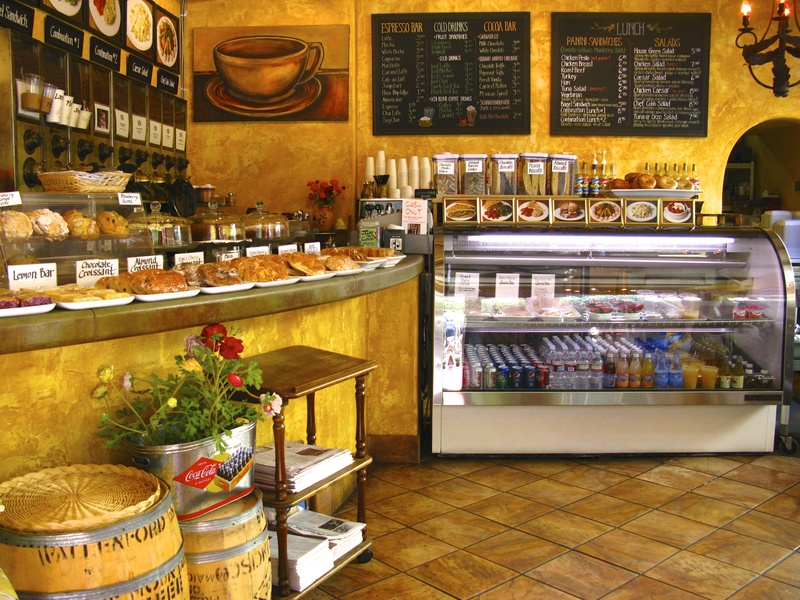 and enjoy a drink and Panini or Quiche to fortify myself for shopping. 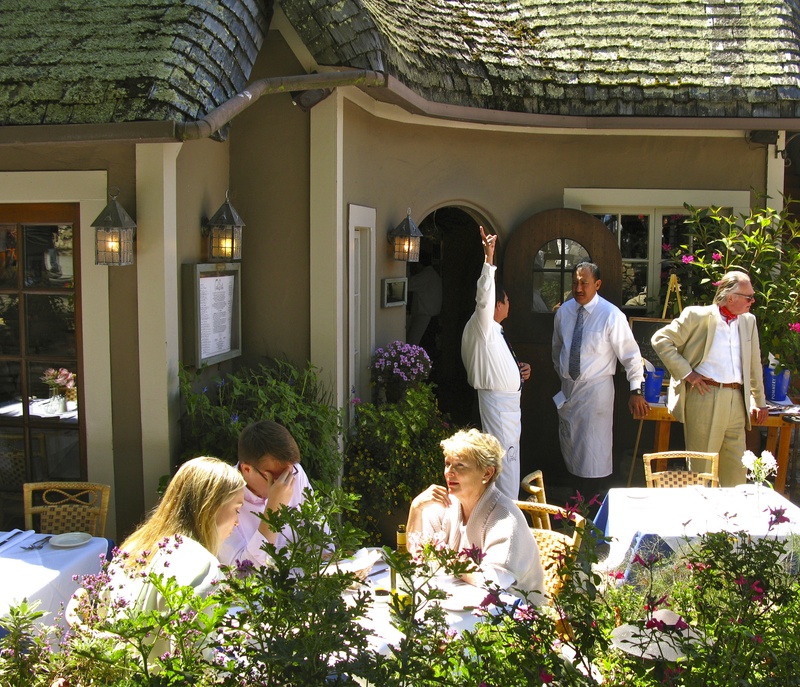 Or stroll over to Bistro Beaujolais Carmel Restaurants | Bistro Beaujolais, Carmel California | Carmel’s Firok Shield Family of Restaurants . 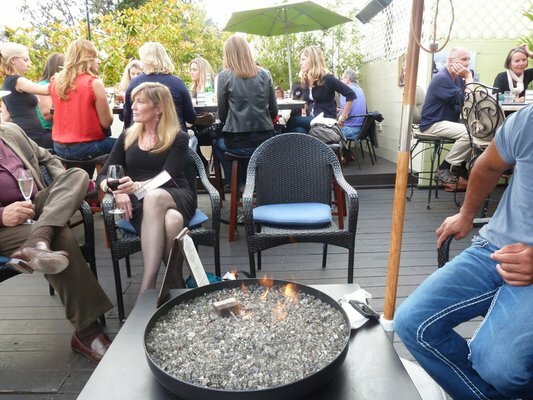 They offer alfresco dining in a garden setting around a fire pit on a heated patio. 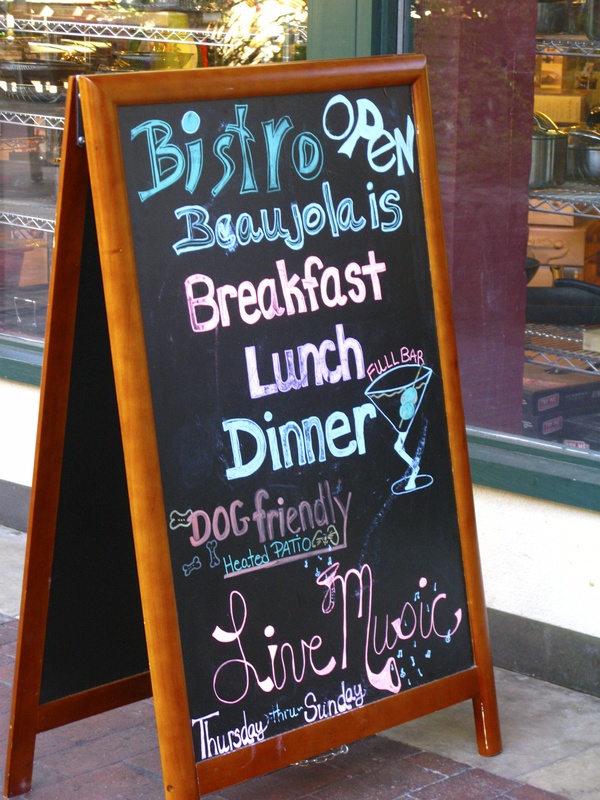 Or we stop for dinner on Friday or Saturday to listen to live music on the patio. And the places to lunch!! 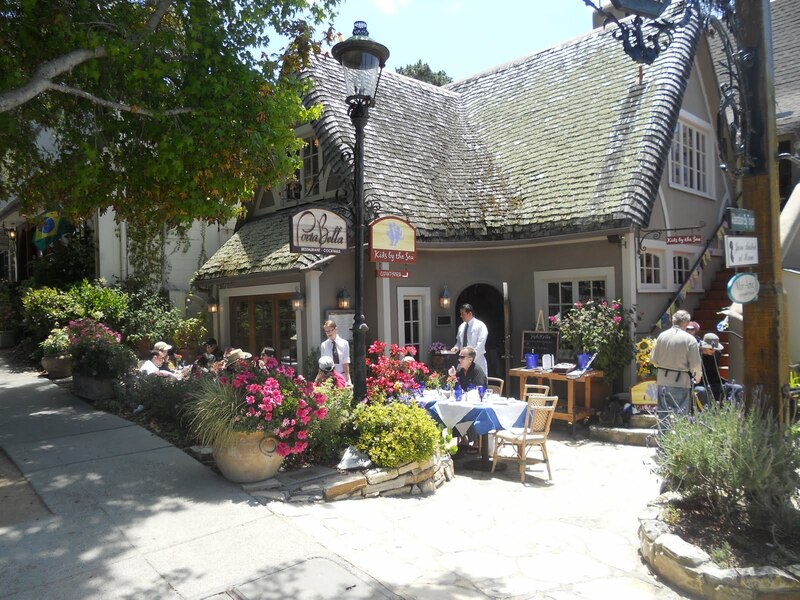 My favorite for a leisurely lunch is Casanova’s (CASANOVA Restaurant :: Carmel’s Most Romantic Restaurant) . 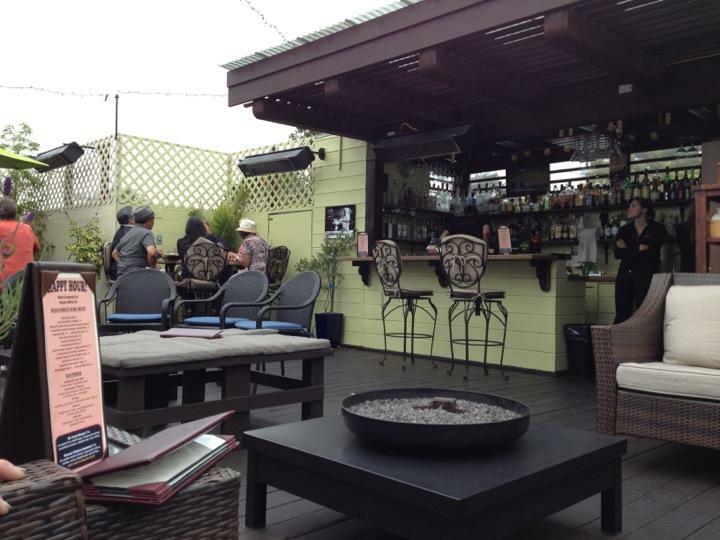 or ask to be seated in the “indoor” patio. 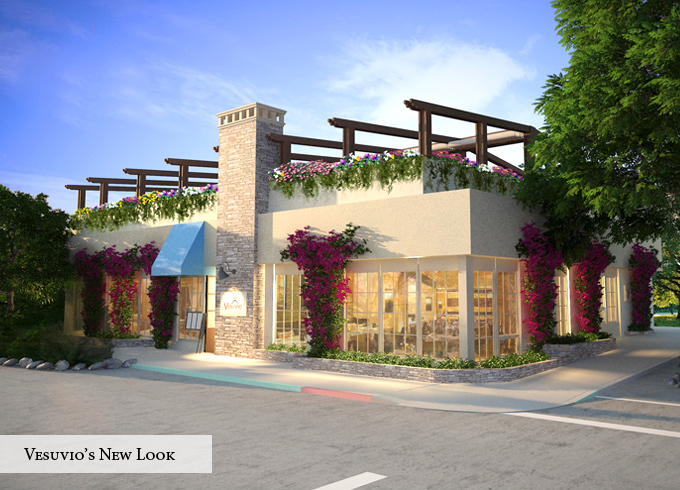 Built around a huge tree, this space is partly covered by awnings and glass roof. Small birds peck at the crumbs by your feet. 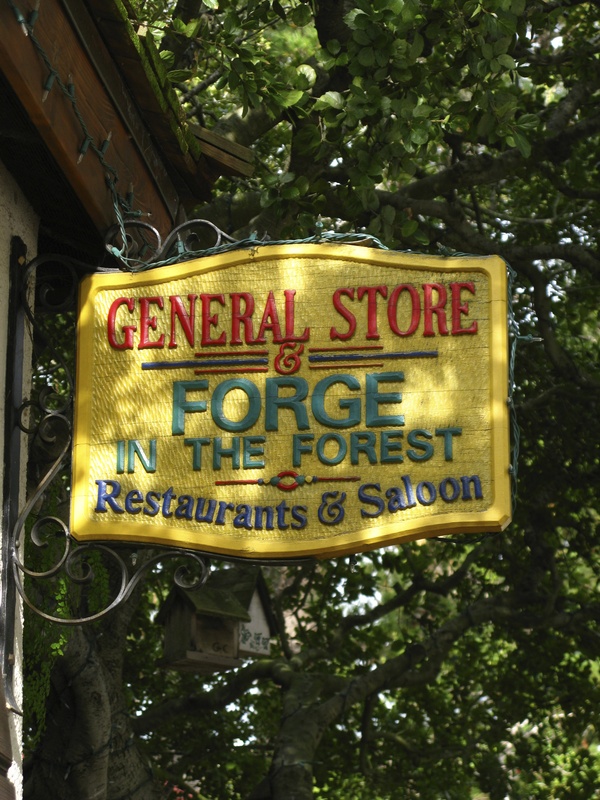 A favorite spot for dog lovers is the Forge In The Forest (The Forge In The Forest Restaurant) . 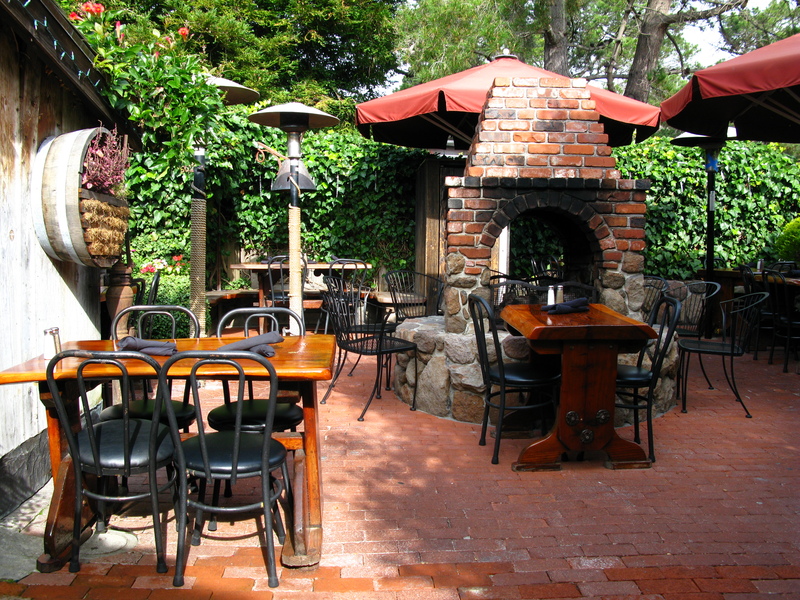 Ivy covered walls enclose the brick patio with its open fireplace and heaters. 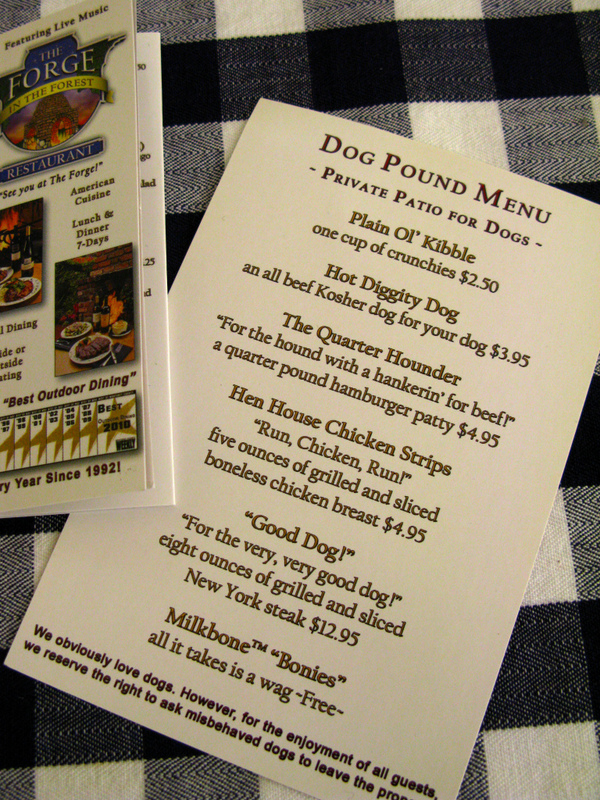 And your dog can order from his very own menu. 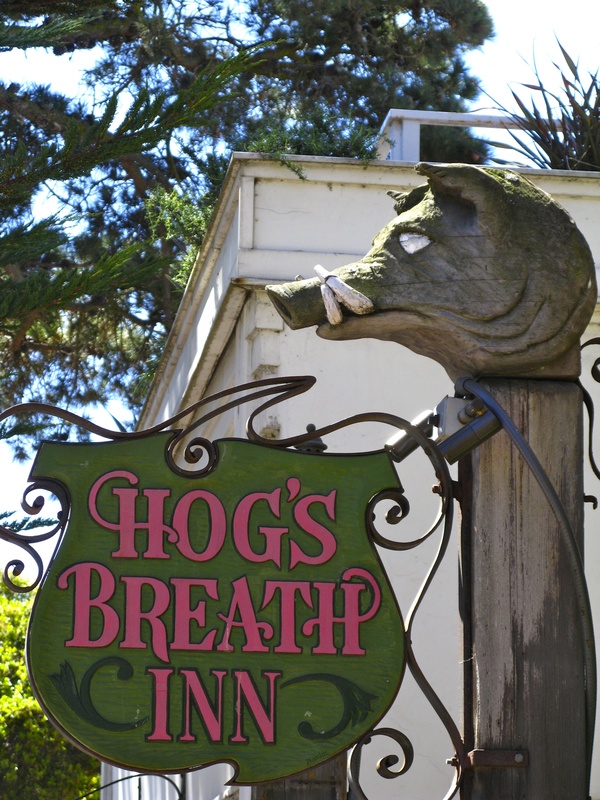 Or drop by Hog’s Breath Inn( Hog’s Breath Inn Restaurant & Bar, located in Carmel-by-the-Sea, California, Hogs Breath Inn, Clint Eastwood Property ) once owned by Clint Eastwood. 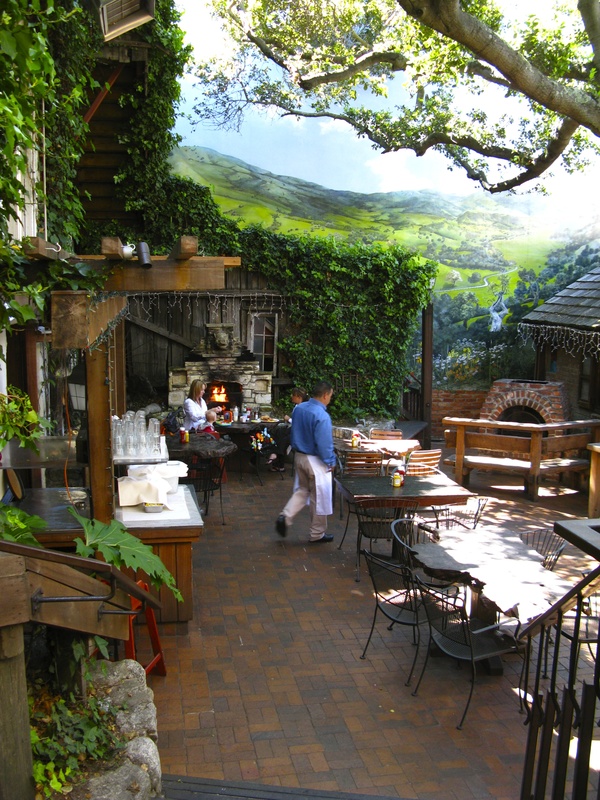 Step down the stairs to a patio made magical by a huge mural. Cozy yourself in front of one of the many fireplaces for a burger and fries. 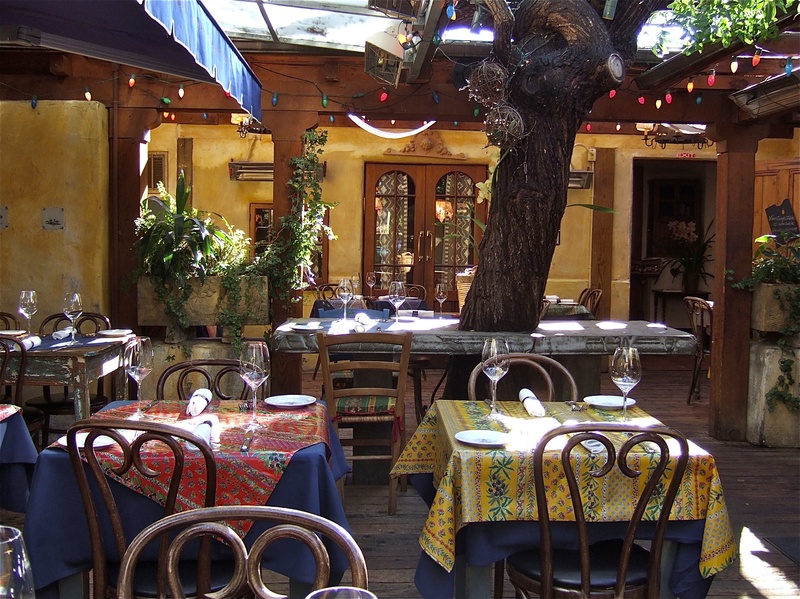 Eat inside or out under umbrella- shaded tables. 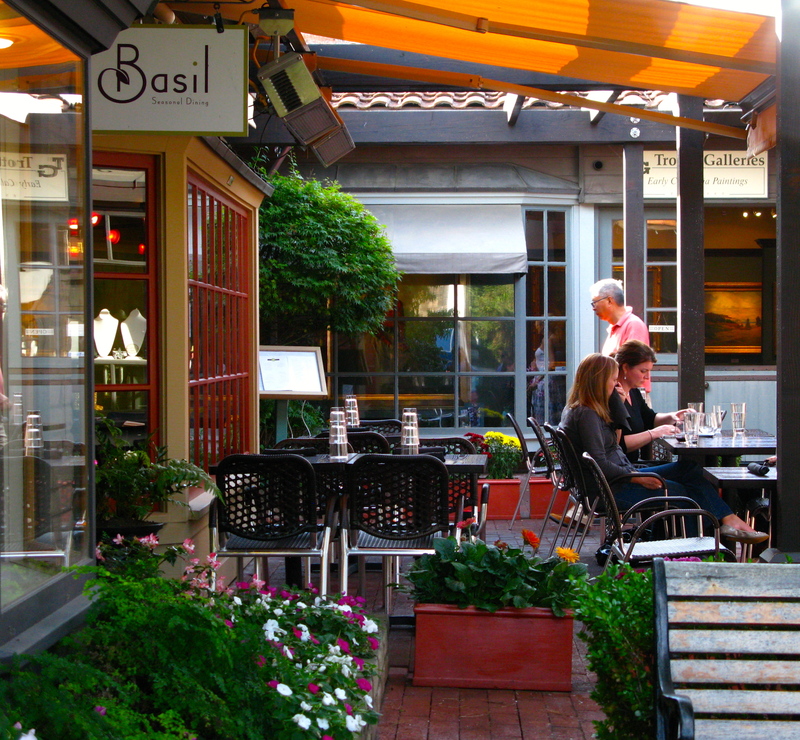 For lunch or dinner, it’s hard to beat Porta Bella’s picturesque sidewalk seating in the Court of the Golden Bough. 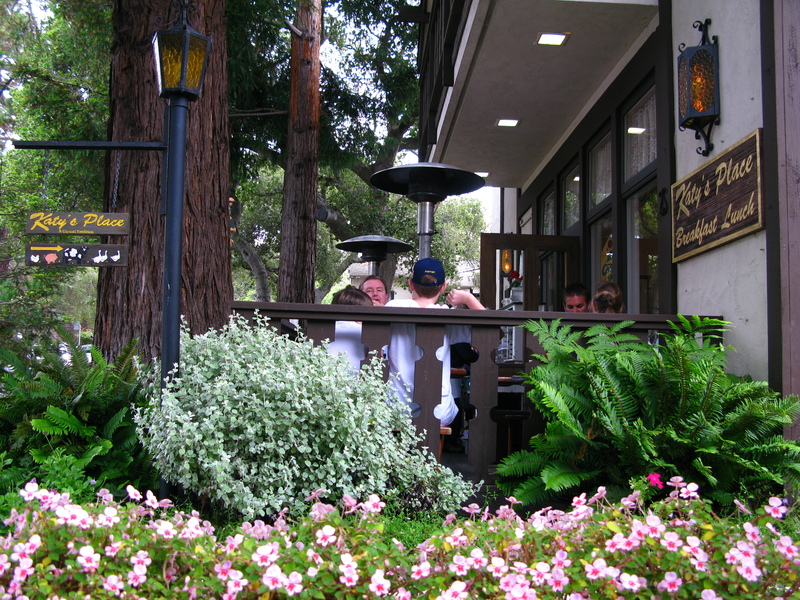 Diners enjoy privacy created by plantings awarded first prize for beautiful flowerscaping from the Carmel Garden Club. So kick off your shoes and relax. despite rave reviews from our friends. 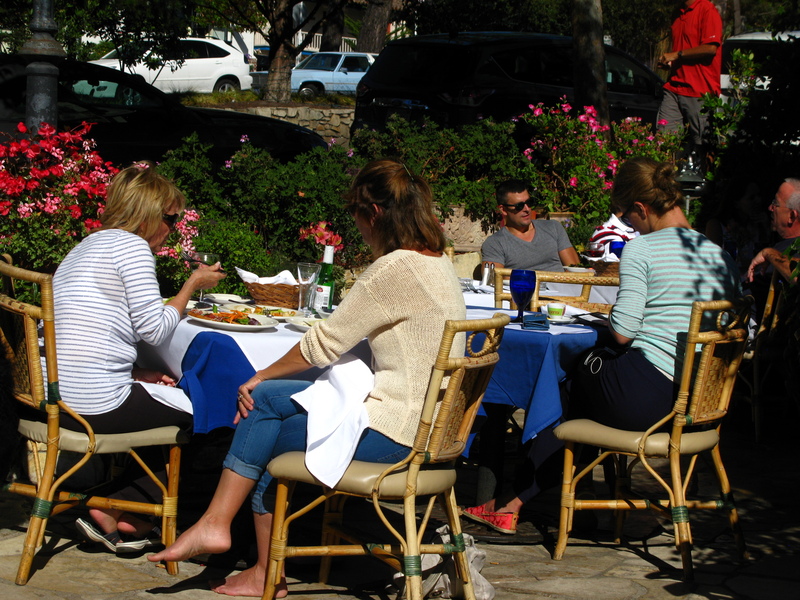 The courtyard dining is alway busy. Dogs receive a complimentary bowl of water. 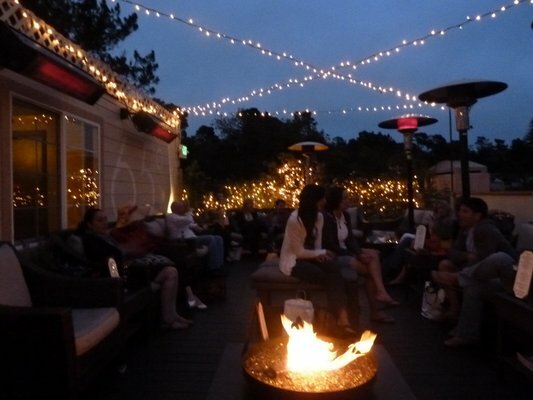 The hottest new night spot for a drink under the stars is the Starlight 65 Rooftop Lounge. 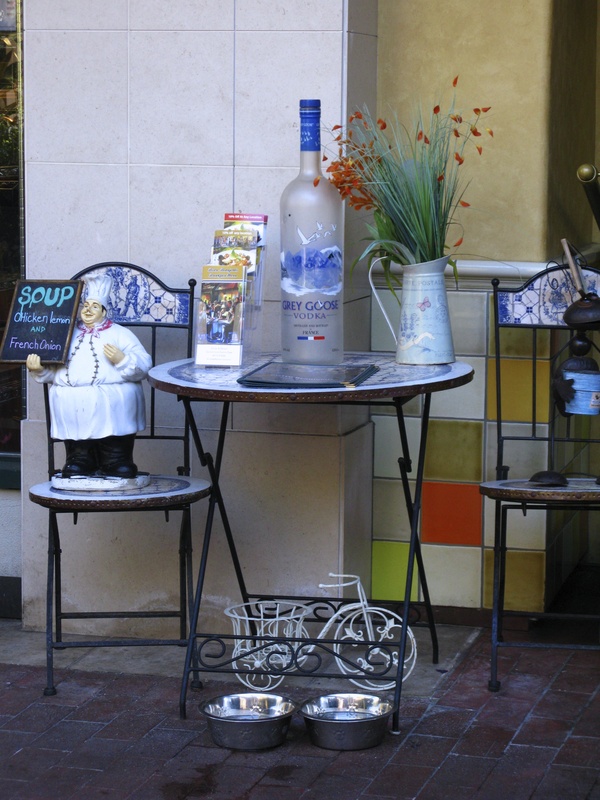 It sits atop Vesuvio Italian Restaurant on the SE corner of Junipero and 6th . Nicole also gets credit for the photos. Thanks Nicole. 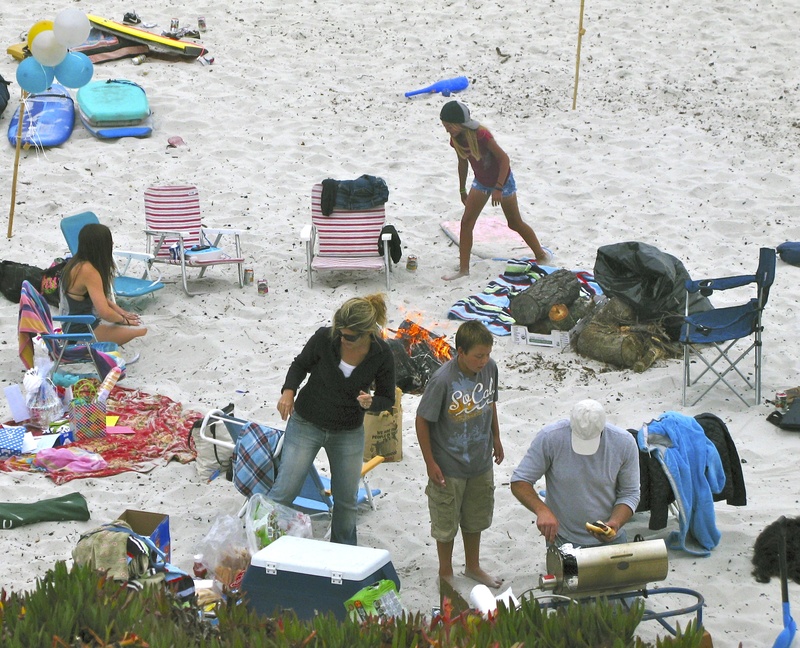 And yet the best place to dine Al Fresco is Carmel Beach at the foot of Ocean Ave. I hear there is a heck of a “ floor show”. Hallelujah! I just came home from shoveling the snow for the second time and here it is: the post from Carmel. Such a treat. Thank you, Linda! I only been to Hog’s breath, Katy’s Place and Casanova from this particular list. Each of them has it’s own charm. 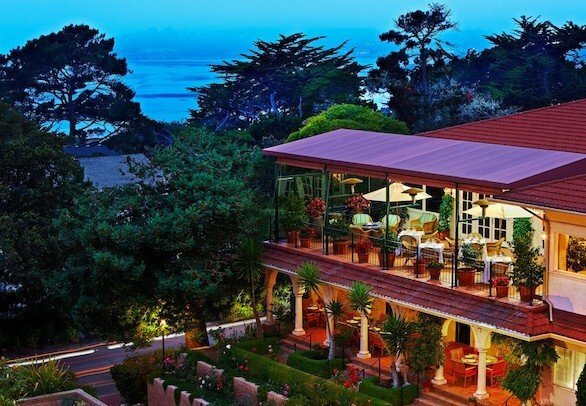 I am flying to San Francisco again this April and will definitely visit Carmel and try a new restaurant. 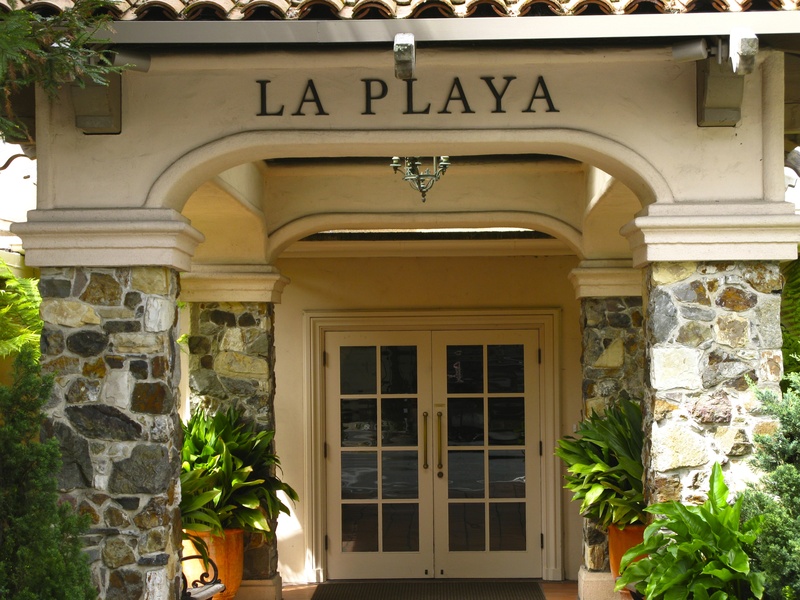 I don’t know what the purpose of my visit yet, but the California is calling…Thank you for the new recommendations. Lovely post. 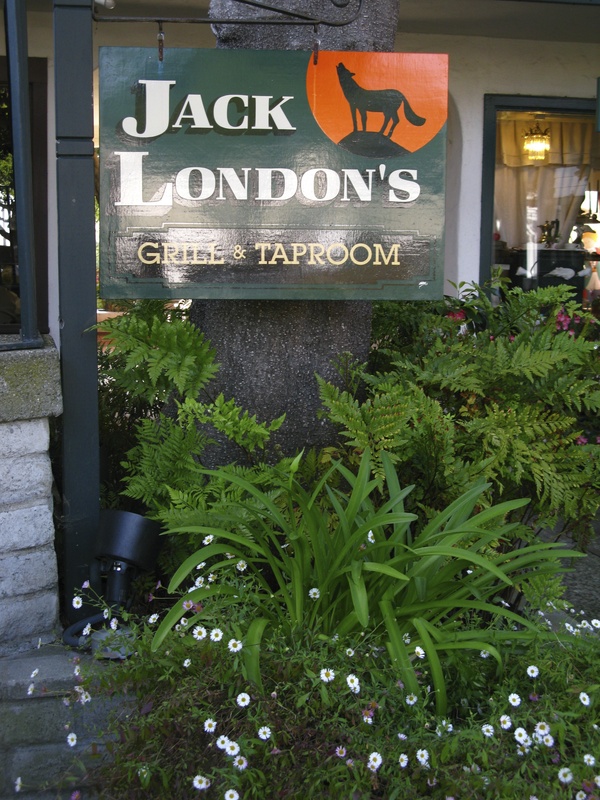 All good choices where we eat often here at home in Carmel. I do so enjoy your lovely blog post of our beauitful village. Note, the court of Golden Bough in the old days was quite different, it had a lovely large Pine tree which is now gone and quaint little stores of all sizes and shapes. We are so glad that horrible Thai restaurant is finally gone. It just did not fit with the lovely atmosphere of Carmel. 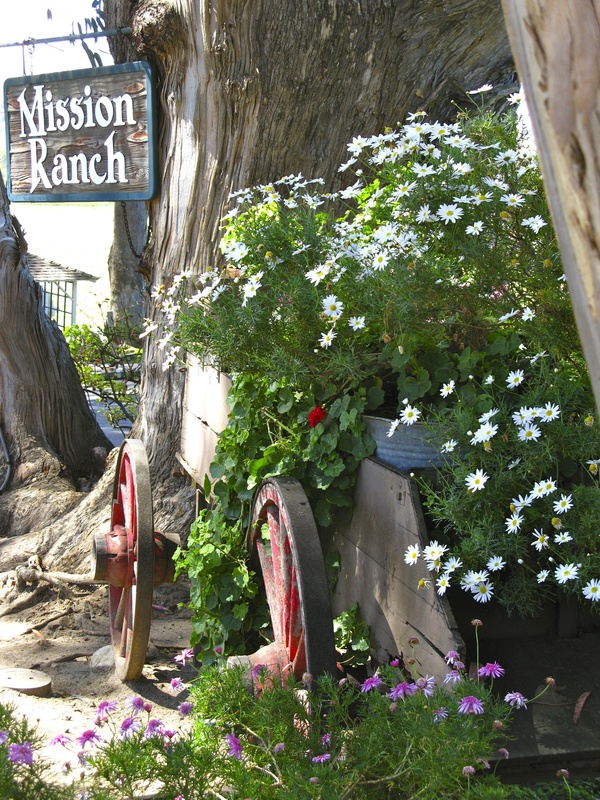 Happy dining, we are heading to Mission Ranch this weekend to dine with some of the vistors for the ATT. .
New blog watcher here… and I am enthralled! 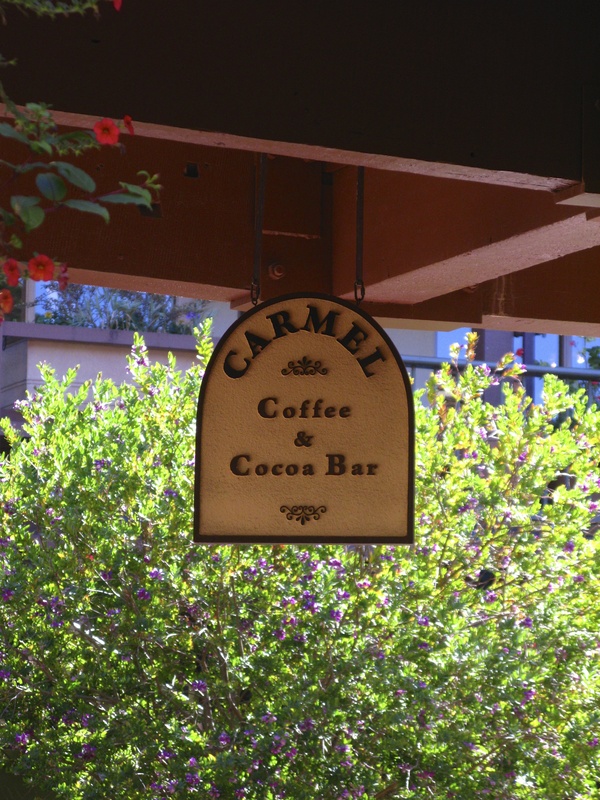 Have been in love with Carmel since the 80’s, visiting regularly once or twice a year. Loved reading the story about purchasing your house in the 90’s and swear we also looked at the same house when it was for sale. The house we got cold feet on and did not buy was called “The Owl”. Although not in the great “south of Ocean” neighborhood, it was a cute little cottage on a large lot. It was a financial stretch for us at the time, and I have always regretted not throwing caution to the wind. 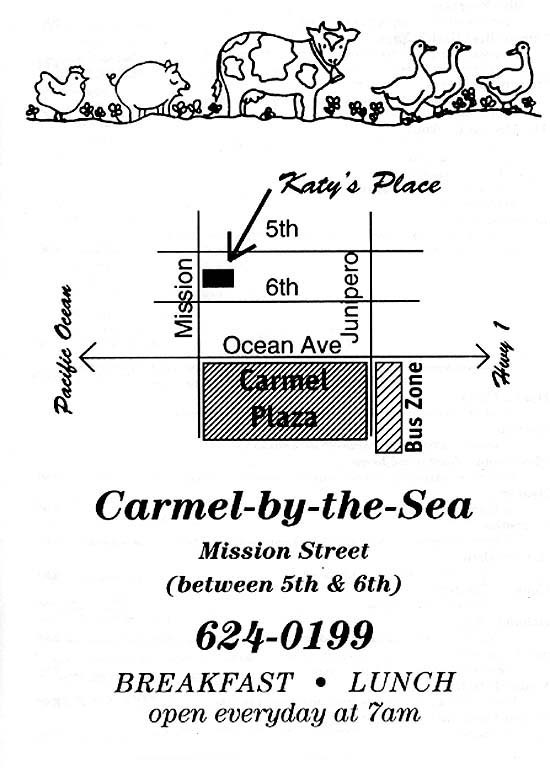 I discovered your blog yesterday and read it through… enjoying the updates and history on the many Carmel architecture ALL DAY LONG! Especially interested in Flanders Mansion, naturally all the Comstocks, the wonderful Inns and restaurants. Thank you for all your lovely photos. 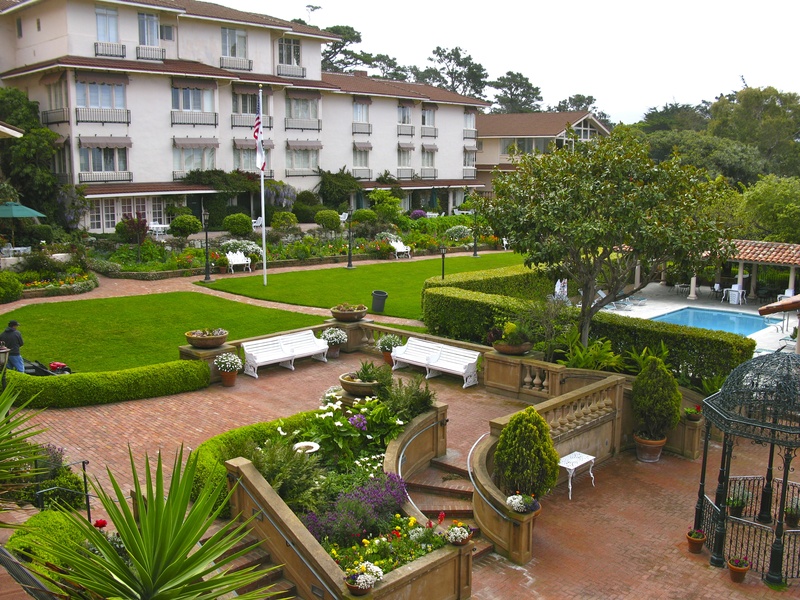 It’s like visiting Carmel when I’m unable yet longing to be there. Your take on walking Carmel is spot on. Though I have NEVER followed any blog, am now a faithful reader! Thank you ever so! Totally love the dog food menu! Just a great description of kc weather…am on the way back from a “girls” trip to warmer climes….sigh!